Available now a selection of Stamps from all around the world, ranging from the first stamps to modern, GB, Commonwealth and many other countries of the world. View: British Stamps (GB, NI and IOM). View: Stamps of the World. 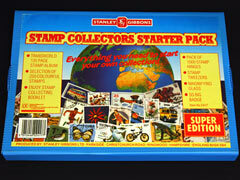 Plus: a great range of stamp collecting accessories. 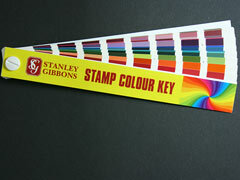 200 colour swatches, showing a vast range of colours, shades and named colours. 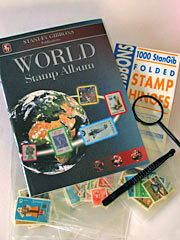 Helps easily compare and accurately catalogue your stamp collection. Stanley Gibbons World Stamp Album starter set, with 65 page softback album to hold stamps from around the rest of the world. Includes, 1000 gummed hinges, plastic magnifying glass and tweezers, plus 150 mixed world stamps to start the collection. Makes an ideal gift. 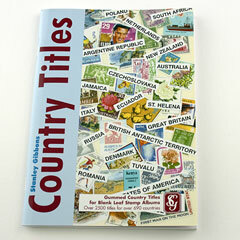 Book of gummed back country name titles, for blank leaf stamp and other albums. Over 2500 titles covering 690 countries, from Abu Dhabi to Zimbabwe. Transparent perforation guide, allows fast and accurate measurement of perforation sizes. Just place your stamps over a dark surface, put this guide over the top and then move up and down until lines match up with perforations. 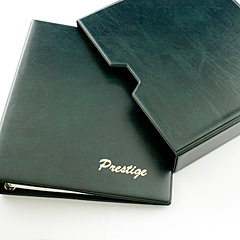 Prestige stamp album is a high quality Green 4 ring padded binder with gold blocked text on the front. Supplied with matching slip-in case. Supplied with 50 pages of 11 inch by 9 inch thick white cartridge leaves (150gsm), which have a light grey quadrille grid printed on, the album will hold 150 pages in total. The Prestige stamp album is a high quality Dark Blue 4 ring padded binder with gold blocked text on the front. Supplied with matching slip-in case. This Loose Leaf album is supplied with 50 pages of 11 inch by 9 inch thick white cartridge leaves (150gsm), which have a light grey quadrille grid printed on, the album will hold 150 pages in total. (this is a blue album and matching case, green version is in photo). Pack of 50 pages of 11 inch by 9 inch thick white cartridge leaves (150gsm), which have a light grey quadrille grid printed on. The Prestige album will hold 150 pages in total. 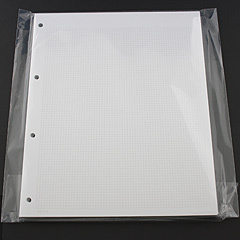 Standard 4 ring pages will also fit many other 4 ring binders. 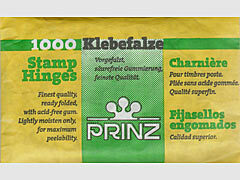 Save money by buying quantity, Consists of 5 packs of 1000 hinges, at 1.79 per pack. Gummed and Peelable Stamp Hinges, fine quality and ready folded. 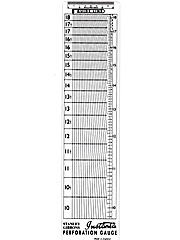 Consists of 1 pack of 1000 hinges. 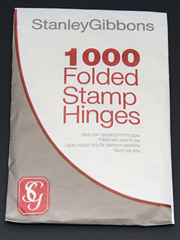 Save money by buying quantity, Consists of 5 packs of 1000 hinges, at 1.99 per pack. Popular 4 ring binder pre-printed with countries - starter stamp collecting album by Stanley Gibbons, with extra pages also available. Contains 100 white cartridge 125gsm leaves, over printed with a grid, along with information about the countries and example stamps. 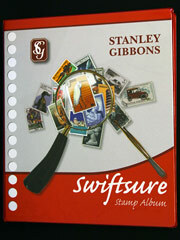 Stanley Gibbons World Stamp Album Super starter set, with 135 page hardback album to hold stamps from around the world. Includes, 1000 gummed hinges, plastic magnifying glass and tweezers, booklet, plus 250 mixed world stamps to start the collection. Makes a great gift.